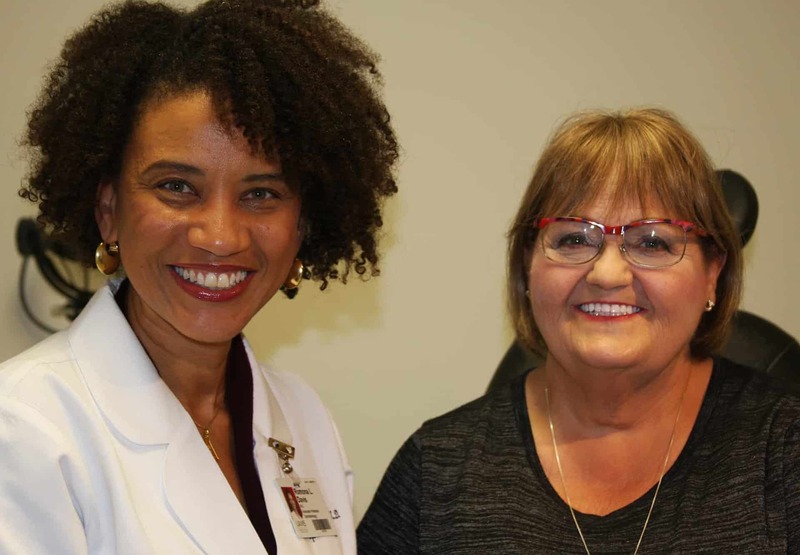 With the help of the UAMS Harvey & Bernice Jones Eye Institute and ophthalmologists like Romona Davis, M.D., Pamela Morehart (right) is able to maintain her vision. Jan. 25, 2018 | Jan. 25, 2018 | Maintaining her vision while three rival eye conditions attempt to steal it away is a battle, but it’s one Pamela Morehart is able to win thanks to the UAMS Harvey & Bernice Jones Eye Institute. “We have a blessing in the Jones Eye Institute at UAMS,” said Morehart. First, there’s the macular degeneration, an eye condition that deteriorates the retina and causes the loss of central vision. Early indicators of it were discovered nearly a decade ago when a regular eye exam discovered drusen, a yellow accumulation in the retina. For the past five years, she’s fought the condition with routine injections to stave off the growth of blood vessels on the back of the eye. Left untreated, these vessels leak and can cause poor vision and even legal blindness. Morehart, of Little Rock, also has glaucoma, a condition where fluid pressure inside the eyes increases. Normally, this fluid flows in and out of the eye, but in glaucoma patients, the fluid collects and causes pressure damage to the optic nerve which can lead to vision loss. Morehart receives treatment for both conditions at Jones Eye Institute from Sami H. Uwaydat, M.D., an ophthalmologist and associate professor in the Department of Ophthalmology in the UAMS College of Medicine. The monthly injections treat her macular degeneration and daily eye drops fight her glaucoma. 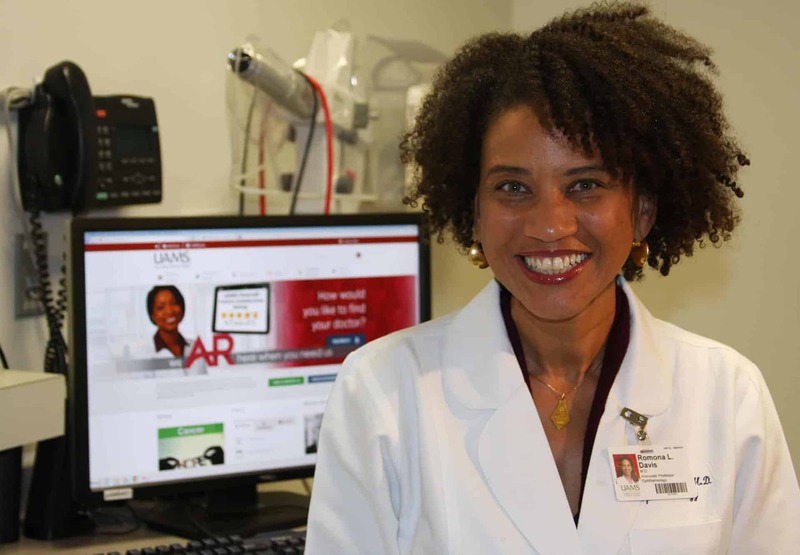 Romona Davis, M.D., assists Morehart in her battle against three eye conditions to keep her vision. Subsequently, Morehart noticed a decline in vision due to cataracts. 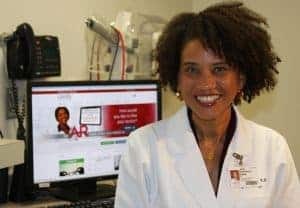 This brought her under the care of another institute ophthalmologist — Romona L. Davis, M.D., also an associate professor in the College of Medicine’s Department of Ophthalmology. Morehart, who enjoyed near perfect vision before her latest eye condition materialized, noticed a drastic change in her vision late in 2016. “From one month to the next, my vision went from 20/20 to 20/80 or 20/100,” said Morehart. In December of 2016, Morehart underwent her first cataract procedure with Davis. In March she had the second cataract removed. Morehart received intraocular lens implants in both eyes, a common treatment for cataract. The artificial lens replaces the natural lens when it becomes cloudy with cataracts. “By removing the cataracts, we were able to sharpen her vision again,” said Davis. Morehart said she’s incredibly appreciative of all Davis and Uwaydat have done to save her vision. Morehart’s connection to Jones Eye Institute extends to her immediate family. Her son, Austin, was 17 years old when a baseball incident resulted in a traumatic injury to his eyes and nearly around-the-clock care for the better part of three weeks by Joseph G. Chacko, M.D., and David B. Warner, M.D. Chacko is director of the neuro-ophthalmology service and a professor in the College of Medicine’s departments of Ophthalmology and Neurology. Warner is director of the cornea service and assistant professor in the College of Medicine’s Department of Ophthalmology. “They feared he would lose sight in both eyes, but 10 years later, he has his vision, thanks to the Jones Eye Institute,” said Morehart. Warner treated Morehart’s 82-year-old mother last year, fitting her with lenses to treat severe astigmatism that caused her eyes to be less round and more of an oblong shape. “She would be legally blind without those lenses,” said Morehart. Also last year, Morehart’s 82-year-old diabetic father received intraocular lens implants, like Morehart, in procedures done by Davis. This month, he renewed his driver license with 20/20 vision in one eye and 20/25 vision in the other.